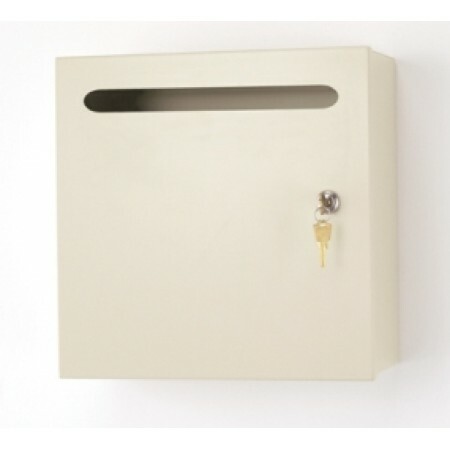 This mail drop box is perfect for collecting payments, reports, courier envelopes and mail with its 10"W mail slot. Perfect for office, mailroom, mail center and retail stores. This private use box gives you easy, one-stop mail collection. Wall mountable to keep counter tops free (note: hardware not included for wall mounting). Other sizes available, click on the following - part number 1400 for small size mailbox and 1450 for large size mailbox. Putty in color. • Heavy duty 18 gauge steel. • All steel mailbox with durable enamel painted finish. • 10"W x 7/8"H mail slot. • Hinged front opens to unload contents. • Built-in lock comes with 2 keys.